Sheriff David Morgan wants you to be safe at all times and that requires a certain amount of both knowledge and vigilance on your part. The pamphlet below is also available as a trifold handout at our ECSO front lobby located at 1700 West Leonard Street in Pensacola. We encourage you to study the suggestions it contains and heed the advice in order to be less likely to be a victim of crime. The information was gathered by the ECSO Community Services Unit. 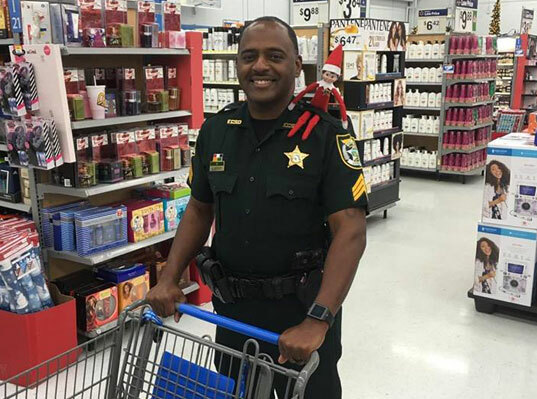 The following Safe Shopping Tips were compiled, in cooperation with the ECSO Crime Prevention Unit, to contribute to your safety and security while shopping year round. We can never be too careful, too prepared or too aware. Please share this information with family, friends and neighbors. Sheriff David Morgan wants you and your family to be safe throughout the year. By practicing techniques you greatly decrease the possibility of becoming a victim of crime. Do not leave packages or valuables on the seat of your car. This creates a temptation thieves. If you must leave something in the car, lock it in the trunk or put it out of sight. Keep a secure hold on your purse, handbag and parcels. Do not put them down or on top of the care in order to open the door. Always carry your Florida Driver’s License or Identification Card along with necessary cash, checks and / or credit card you expect to use. Even though your are rushed and thinking about a thousand things, stay alert to your surroundings. Be extra careful if you do carry a wallet or purse. They are the prime targets of criminals in crowded shopping areas, bus stops, on buses and airports. Beware of strangers approaching you for any reason. “Con-artists” may try various methods of distracting you with the intention of taking your money or belongings. If possible, while shopping, leave small children at home with a trusted babysitter. Teach your child to go to a police officer or store clerk and ask for help in case your child is separated from you. If you must use an ATM, choosing one that is located inside a mall, or well-lighted location. Withdraw only the amount of cash you need. Do not throw your ATM receipt awaay at the ATM location. Report all crime and suspicious activity to the ECSO. In an emergency call 911. Non emergency call: 436-9620. Questions? Call Community Services at 436-9281.